The sports industry is a massive moneymaker both in the United States and around the world. Dedicated fans of football, soccer, baseball, basketball, and other games are eager and hungry for content that will satisfy their sports cravings. Revenue from sports is growing, and shows no signs of slowing down anytime soon. According to Statista, in 2005 the global sports market made $46.5 billion. By 2017, it’s projected to rake in $90.9 billion. Sports’ popularity presents a unique opportunity for brands to create content and increase their audience size. If you’re in the sports industry, or you want to pursue content marketing campaigns that will attract sports fans, you need to know exactly how to reach them. Here are some ideas for content you can produce that will appeal to sports fans and draw attention to your brand. The most popular sports YouTube channel is Dude Perfect, which boasts 878 million views and 6.5 million subscribers. They release videos that poke fun at sports like golf, ping-pong, bowling, and pickup basketball, and parody what the sports are all about. For example, in one video, they use plastic golf clubs instead of regular ones in a fake competition. Dude Perfect not only comes up with stellar content; they also reach sports fans by being funny, which is not usually par for the course. People become emotionally invested in sports, and are angry or upset when their teams lose. They’ll shout at the TV and type up bitter tweets, but aren’t often given a chance to take a breather and laugh. But on YouTube, sports content creators can feel free to joke around. Even ESPN does it in this video, a scripted tale of how New England Patriots tight end Rob Gronkowski showed off his ring around the SportsCenter office. The chance to extend the game beyond the field is exciting for sports fans. That’s where fantasy sports come into play, as well as content and tools that can be created around it. When football is in season, fans clamor to fantasy sports to win money and show their prowess for predicting winners. One highly utilized tool for these participants is a lineup optimizer, which will give them insights into players’ records and key stats. By using this tool, they can feel like they’re part of the game in some fashion, as well as build a community by interacting with their friends and other players. Another tool that sports fans can utilize is SportsInsight’s platform for betting insights. Just like the lineup optimizer, it allows sports fans who want to participate in the games off the field a better chance at winning. It contains analytics, odds, predictions, weather alerts, and injury news that may affect how fans choose to bet on their players. 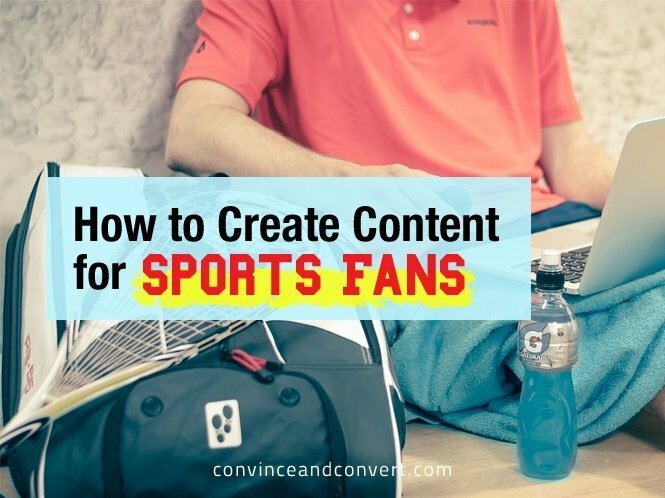 By putting out content that will work to their advantage, and helping them succeed at their own games and hobbies, you will attract sports fans from all over. Many sports fans both watch games on TV and listen to them on the radio. Judging by the popularity of sports podcasts, they’re also flocking to these online radio shows to hear more about their favorite teams and fantasy football tactics. Of all the top podcasts on the Stitcher podcast platform, the second most listened-to show is CBSSports.com’s Fantasy Football Today. Hosted by Adam Aizer, the hour-long show covers the information that fantasy football players need to win in their leagues. For example, the latest episode is about Jordy Nelson’s injury and who the winners and losers of the pre-season are thus far. There are also a number of sports podcasts on iTunes, which lists the top 200 on its charts. They include Fantasy Focus Football from ESPN, Harris Football Podcast, Footballguys.com, Pardon the Interruption from ESPN, and PodcastOne’s The Dan Patrick Show. Sports fans love their facts and statistics. They’re interested in knowing all about players’ records and histories, as well as their teams’ tactical methodologies for winning. They want to collect this knowledge, and then use it to prove their allegiance to teams and players. If you want to get sports fans involved in your content, create quizzes so that they can test and show off their knowledge to their friends and family. For inspiration, check out BuzzFeed’s sports section, which contains a number of fun quizzes for fans. Quiz players will be inclined to show off their results, which will lead to more hits on your brand’s website. Make sure that your quiz can be shared on Facebook and Twitter, and that you congratulate your best quiz takers at the end of it. Sports fans are extremely beneficial to any brand. They are loyal to their teams and players, and will show that same affinity towards you, as long as you keep coming up with great content for them to digest. Now that football, the biggest sport in the U.S., is starting up soon, it’s time to jump on the sports content marketing bandwagon.